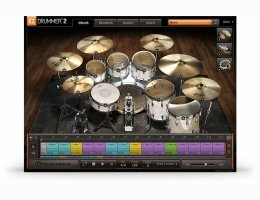 EZdrummer 2 takes drum production to a whole new level. It was designed to erase any technical barrier between you and your creativity and introduces several groundbreaking features for quick and easy songwriting. In EZdrummer 2, you can go from initial rhythmic idea to finished, mixed and customized drum track without ever leaving the program. This is without a doubt the best sounding, most intuitive and creatively gratifying software environment for drum production on the market – a perfect marriage of sound, form and function. EZdrummer 2 introduces several features when working with MIDI drum grooves. Tap or record your rhythm to find a matching groove, search by filters or browse the traditional way in the conveniently laid out MIDI browser. Go from initial rhythmic idea to full track! Drag and drop drum parts to build your own track directly in the program – or let EZdrummer 2 do it for you! If you drop a groove in the Song Creator, it will list all files with a similar feel and style. It will also let you lay out a complete track using included or user created song templates. For the first time ever in a drum software setting, you can now “communicate” with your drummer. Use the Power Hand to instantaneously change the leading instrument or the Amount or Velocity knobs to control the complexity and velocity in your selected groove – while it’s playing! Done with your track? EZdrummer 2 has a wide selection of ready- made, user controllable effect chain presets to ensure that the final mix sounds exactly right for your song. Welcome to a new era of drum production for songwriters. Audio Unit, VST, AAX or RTAS host application and professional sound card recommended. Stand-alone version included. 4 GB of free hard disk space. Mac OS X 10.6 or higher, Intel-based Mac with 2 GB RAM.